Finally got round to installing the Comichaus app today – and instantly regretted not doing it sooner. The very first book I picked, pretty much at random, is fantastic! First up, this is not an all-ages read – there’s violence and swearing a-plenty, so if you’re under like 10 or whatever (when do they start swearing and playing inappropriate games these days? ), you shouldn’t be reading this…Seriously though, it has a “Mature” explicit rating so save it for later kids; there are plenty of cool all-ages books out there for you. Right, on with the (no spoilers) review. Something that used to right-royally yank my tatlocks was a cover that hooked you in and made you buy a book that was a load of old turd on the inside – I’m very happy to report that this bad boy is 100% on the button; the cover looks just like the internal art. Which, in case you’re wondering, is freakin’ awesome! The colouring uses lots of gradients and a slightly muted, but rangy, palette that works beautifully with really fantastic linework – and this is the real strength of Mims’ work here – he does an inspired job. At first glance it looks like there are too many lines, but somehow, it works to create a strongly graphic feel with sparse backgrounds, expressive characters and great action. This is some of my favourite artwork this year; sweet! The story is a little off-the-wall and, although you might think you can spot the backstory of the main characters pretty quickly, issue 2 ups the ante and raises an eyebrow: no spoilers, but there appears to be at least one pretty famous dude in this series… I’m digging the premise and I’m looking forward to seeing where this story goes and I’m kind of expecting it to be not where I think! 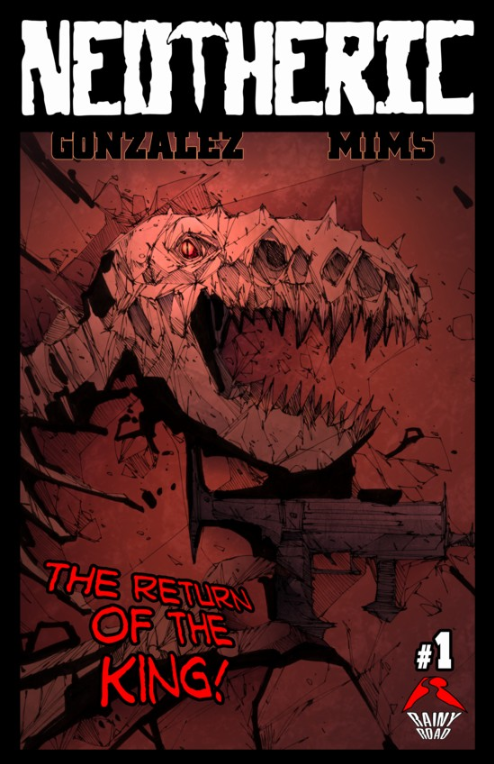 The dialogue throughout is nice and tight, funny, and natural – really great work which isn’t always in evidence in indie comics and a big thumbs up to Gonzalez for this work. Gonzalez also does the lettering duties here and does them brilliantly. He’s come up with some neat ways of dealing with different voices and the word balloons are tidy and sized well for the panels. A big shout out to him for the use of thought balloons too – I miss them. All in all, you want to jump on board with this immediately, like now! It’s worth the Comichaus subscription all by itself! Amazing value!